Around 12 years ago we tried to sell our house thru a well know reality firm nothing happened. My husband and I were very discouraged. At that time I was Office Mgr.for a dental office and knew Rosemary as a patient. She has a personality that just glows. I asked if she could help us. She did alright within weeks. If that wasn't enough we asked her to find us a house. She was on it ,we saw a house for sale close to one we had just looked at. She made a phone call and we were allowed to see another house not on our schedule that day. She pointed out things we needed to know about, checked out the neighborhoods for us. We found our house the day it was listed, bought it the next day. Since then my son ,daughter, step daughter, in-laws, and family members have bought and sold houses from Rosemary. We never hesitate to recommend Rosemary. Judy C.
Rosemary Meyer is a joy to work with. She is everything I'd want in a real estate agent. She brings market knowledge with her advice always helpful and well thought out. She's very responsive and does just the right amount of proactive staying in touch. We always have good information but never ever feel pushed. On a personal note she is fun to be around but serious when need be. She's someone who makes you will feel like a friend you can trust and is looking out for you. Although I only recently met her through our current real estate process I would not hesitate to recommend her. Some agents come off too aggressive or too part time, she is just right. Give Rosemary a call or interview and you'll see what I mean Tim in Overland Park, KS. I have to put the highest rating on each quality. She is a true professional and really cares about her clients and their interest. This is not an exaggeration. I have worked with other agents before, and none could mach her expertise and passion for excellence. Carol L. Shawnee Mission, KS. 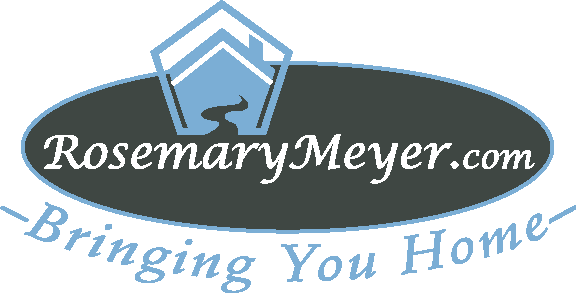 I can't say enough about Rosemary Meyer! I was so afraid about selling my home and don't think I would have been able to do it without her help. She was so helpful and understanding and helped me through this process every inch of the way. I really didn't know where to begin from cleaning up my home, organizing all the "things" I had accumulated over the years to help set up my home so it could be shown in the best light possible. She came over when I needed help organizing and a shoulder when I needed support emotionally physically and mentally. I did not understand any of the financial aspects of selling a home and she went over the financial details. Always for the best outcome for me. She was so very patient, kind, supporting so very helpful and understanding. L Sue F.
We absolutely love Rosemary, she is dedicated to what she does and committed to helping her buyer get exactly what they want. We have bought 2 homes and sold 1 with her and I will never use another agent. I have referred her to others and I always get the same feed back of thank you so much for giving me her name, she is awesome. Family in Overland Park, KS. Rosemary was amazing to work with! A friend recommended her to us and I am glad she did. She truly cared to help us find the best home to meet our needs. Answered all the questions we had, gave us great advice, and always kept us informed. We are very lucky to have had the pleasure to work with her. Shawnee, KS. She is a great realtor. She helped us through the sales process. We had to go out of town and she handle all the issues for us. She was always available to assist with contractors. Eusebio G.